We still struggle for empowering spaces to hear the voices of Black women of the African diaspora, including those part of powerful spiritual traditions outside of the typical Abrahamic religions (Christianity, Islam, Judaism). 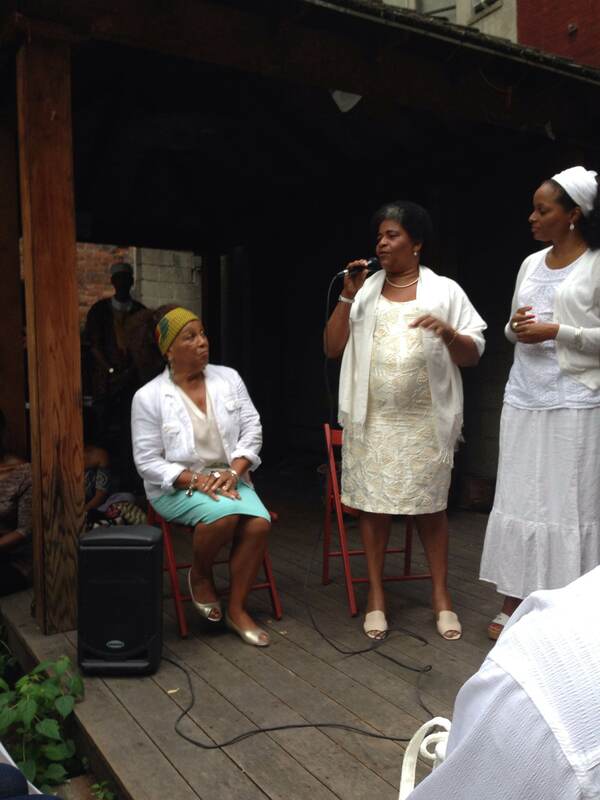 But during this month, CCCADI has hosted a few events honoring specifically Brazilian women of the Candomble religion and their struggle to continue these traditions onto the next generations despite persecution from those in power. First was “Spirituality and Justice in Brazil” featuring a conversation with Candomble priestess and activist Iyalorixa Valinizia Pereira and translator Lorelei Williams at La Casa Azul Bookstore. From one of the most well-known terreiros (ritual temples) in Bahia, Brazil, Terreiro do Cobre, Pereira is responsible for the preservation of sacred rites, ritual music and dance, medicinal knowledge and liturgical African languages passed down to her for seven generations. Candomble is a West African-derived (or an African-Matrix religion as Pereira and Williams described) syncretic religion. The primary purpose of Candomble is to cultivate a connection to nature and spirit because we cannot do anything without the elements of nature, like the energy of water or the plants and greens that nourish and heal us (early morning usually include herbal baths). Candomble members believe in one main God, Oludumare, who is served by or is dispersed into numerous smaller deities, the Orixas, like Chango, Yanson (Oya), Omulu, Osain and Oshun, who are responsible for different aspects of nature. Pereira described this as universal connection to nature even if one is not religious. 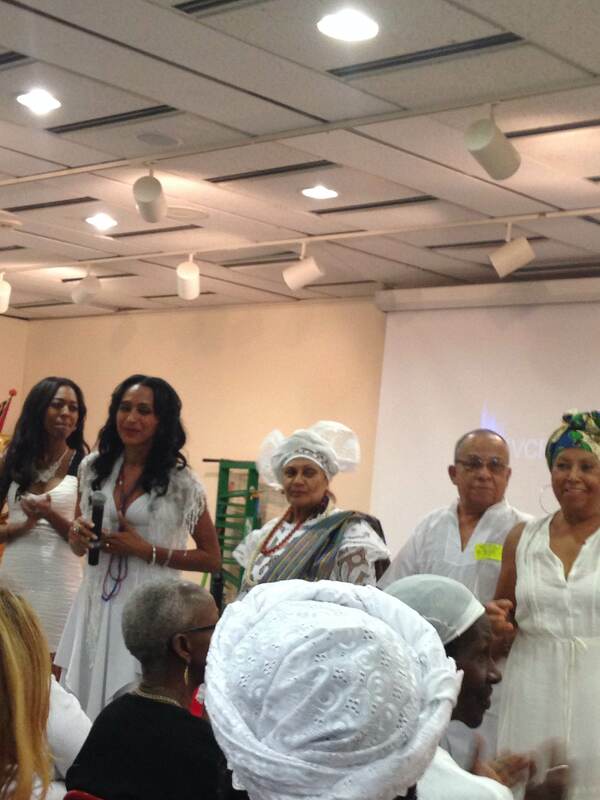 However, while Candomble is a legitimate spiritual tradition, one that has been fundamental to Afro-Brazilian survival, and cultivation of spirituality and well-being, Pereira spoke about the persecutions that the religion and Brazilians of African descent face, mainly from the Neo-Pentecostal church, who believe in only one God who controls all aspects of nature. Pereira gave an example of how Neo-Pentecostals will buy the biggest buildings in the neighborhood, right in front of terreriros and put up big signs. She said they also take advantage of poor people; while Candomble members give back to the community unconditionally, Pentecostals tend to proselytize and help on the basis of the acceptance of their God. Pereira feels part of the reason for the persecution is that they are not as exclusive and welcome everyone. The persecutions they face in Brazil are similar to some that Black Americans face, like police brutality, environmental issues (deforestation, droughts, land takeover), and failure of proper support from the government and mainstream institutions, like schools, to teach Afro-Brazilian and Candomble history and culture. Pereira told us about the co-opting of Afro-Brazilian traditions by mainstream institutions that do not acknowledge the Afro-Brazilian roots of them, like the martial arts/dance capoeira. There are currently Black Power movements in Brazil that are fighting to reclaim those traditions and history; for example, a successful petition took place to the stop the teaching of capoeira in colleges without acknowledgement of its relationship to Candomble and Afro-Brazilian culture. CCCADI founder Marta Moreno Vega emphasized the importance of these spiritual traditions, saying that they show how we survived as a diaspora when we were not mean to and that memories of these traditions survived with us. Unlike Christian doctrine that tells us that we were born with original sin, African-matrix religions tell us that we are born sacred; everyone is born with a guiding spirit or destiny and ancestors. She continued that any religion that states that you are born with sin and have to cleanse yourself, it is a religion that enslaves you and is not for you. Her sentiment was reiterated at the opening ceremony for the Mulheres De Axe exhibition of costumes of the Orixas and Candomble-related photographs, the book and DVD (Available here) launch, and cultural show. Coordinated by Marcos Rezende and organization Coletivo de Entidades Negras (Collective of Black Organizations), the book, Axe Women, celebrates the women of Candomble tradition who often are not recognized. He also agreed that Afro-Brazilian culture and Candomble are the roots of not only popularized culture productions like capoiera, samba and carnaval, but also ethics, literature and wisdom that had seeped into the broader culture, and these traditions are usually passed through Afro-Brazilian women. Besides Marta Vega and Silvana Magda hosting the event, a few other “women of axe” who are located in New York City joined the event and talked about their own experiences in helping shape future generations. Oseye Mchawi is the administration for the Center of Law and Social Justice and is the founder of Yoruba Society of Brooklyn, Inc. She uses the values she has learned from Yoruba tradition to empower the diaspora and its youth for the future as we face further attacks from without and within our communities. Gloria Rodriquez is a professor of psychology, centering her studies on women and spirituality. She founded DeAlmas Women’s Institute, where she is arming future generations of women to foster change and healing in the world. Angela Fontanez, a filmmaker and teacher who began at the Black Journal workshop, declared that everyone has axe and a sense of purpose gained from life experience. As we ended the night with music, dancing and food, it was great to know that there are spaces like this that exist where black Afro-descended women can come together with others and celebrate their whole being from their wisdom and knowledge to the movement of their bodies. ﻿ Me parece que no te has informado satisfactoriamente. This is a magnificent article! Thanks! I will update that on the post.